The Kendo shinai practice sword is made out of bamboo wood with a leather wrapped handle. It will take quite a beating! Overall length 44 inches. The Daito boken sword is made out of solid red oak and is capable of breaking bones if you're not careful when sparring. Overall length 40 inches. The Chinese sword is made out of a hardwood. Overall length 39 inches. The Tai Chi sword is made out of a hardwood and is engraved. Overall length 35-1/4 inches. Each of these practice swords is made of a hardwood. The dagger is 17 inches long, the broadsword is 38 inches long, and the hand-and-a-half sword is 48 inches long. Looking for a broadsword you can really use for stage combat or any full contact sparring? Made by Chen Chao-po (known in the U.S. as Paul Chen), this broadsword is made of tempered, high carbon steel. The sword has a fuller on both sides of the blade and rounded tips. 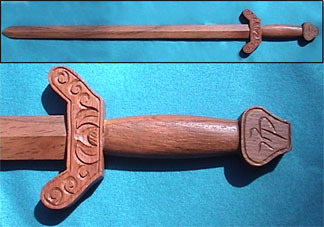 The handle is leather-wrapped wood and the sword come with a wooden scabbard. Unlike some blades on the market, this one is specially designed for sparring or the blade on blade contact needed in stage combat. The edge is not tapered to a thin cross section (necessary if you want to sharpen a blade); but rather, the edge is about 1/16 inch thick along the whole length. This allows for repeated edge to edge contact without the blade notching up terribly. (If you fight with blades, you know what we mean).